Jack Byrne moved to Coolock. Jack speaks about moving to Coolock in the 1960s, watching the area transform with the development of the factories (Cadburys, Tayto). The arrival of the Northside Shopping Centre. 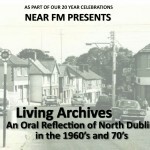 He also speaks of his own involvement in setting up the Coolock/Artane credit Union, NearFM and other in the area.